At the height of growing season, savor homegrown flavors found at Ole Red. What you expect to find on Nashville’s Broadway: live bands, dancing, and fried bologna sandwiches. What you don’t: handcrafted cheeses, grass-fed beef, and locally grown fruits and vegetables. For as long as there have been honky-tonks, beer’s been the thing. But that’s all changed at Ole Red, where many local ingredients take center stage on a chef-driven menu. To Pittler and Executive Sous Chef Joe Denomme, choosing ingredients has always been a personal matter. They’ve worked with several of these farms for years, well before Ole Red came into existence. Take Denomme and Pittler’s relationship with Black Hawk Farms. The pair and their families have spent time at farmers Milton Cook and Brandon Oliver’s cabin — hunting, riding four-wheelers, and grilling out. A closer relationship with farmers means tastier food on the plate, whether it’s in the form of a pan-seared scallops dressed with a sweet corn puree or a classic burger. 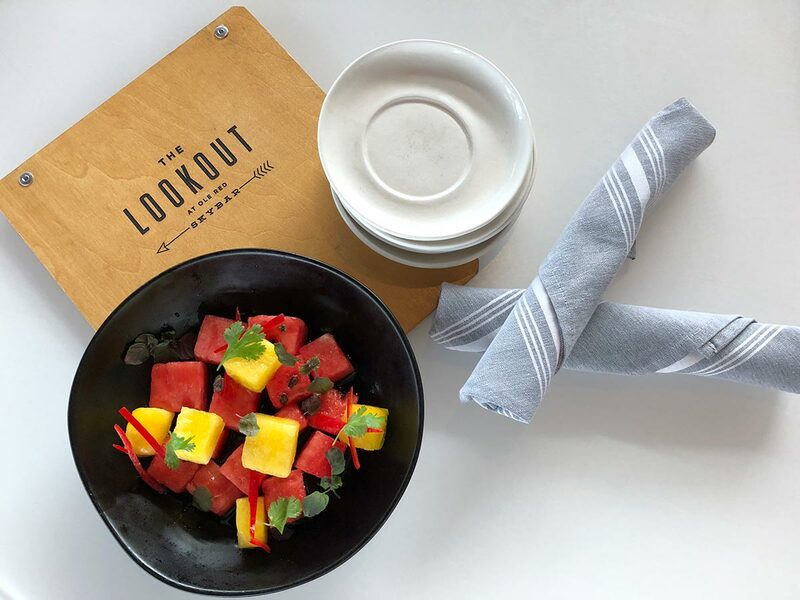 You’ll find local ingredients not only at The Lookout, Ole Red’s stylish rooftop bar and restaurant, but also on the downstairs menu. In fact, the Blue Tick Burger might just be the best representation of Ole Red’s local offerings. The bun is made in house, Black Hawk Farms supplies the beef, S.E. Daugherty & Sons Farm grows the onions and tomatoes, and the cheese comes from Sweetwater Valley Farm. The only thing that isn’t local is the lettuce. We’ll take it. Get to know the farmers behind your meal at Ole Red. Read about each below. When cousins Milton Cook and Brandon Oliver completely rethought the way they farmed in 2013, Cook says people must’ve thought they were crazy. Since 1970, their family farm located in Black Hawk, Kentucky — an hour and 20-minute drive to Nashville — had produced corn, soybeans, wheat, and calves. They’d ship corn feed and the calves out west instead of raising the cattle to maturity themselves. But five years ago, Cook and Oliver realized that with a little persistence, they could raise sustainable, superior-tasting beef. So, they shook things up: Black Hawk Farms began to raise its cattle on a grass-fed diet before finishing them with food-grade white corn that’s good enough for the table and blended with hay from Black Hawk Farms’ own fields. Unnecessary? Hardly. You are what you eat. To avoid relying on hormones and antibiotics, Cook and Oliver finish their cattle slowly over the course of 500 days, instead of the conventional 180. “The beef Ole Red is serving today, we were thinking about it two and a half years ago,” Cook says. A longer finishing period means more work for the farmers but irresistible marbling in the steak that meat-lovers crave. If you’ve eaten a burger at Ole Red, you’ve enjoyed Black Hawk Farms’ beef. Some folks ask Cook why the farm uses premium cuts — like short ribs and skirt steak — in its ground beef. Meanwhile Cook will never understand why people will go to great lengths to mask the taste of beef by loading a burger up with onion rings and other excessive toppings. “You just eat a patty with salt and pepper, and you can’t hide anything when you do that.” Call us crazy, but we’ll have another. 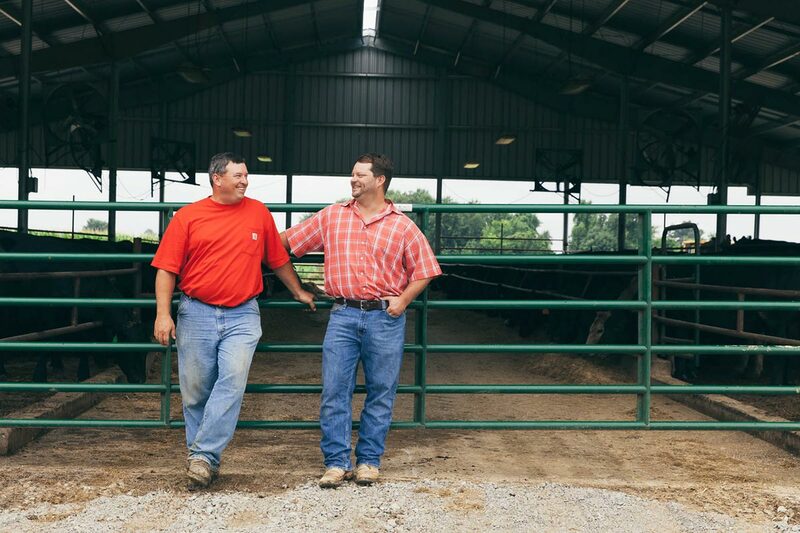 Cousins Brandon Oliver (left) and Milton Cook worked with the University of Kentucky to construct a compost barn in which cattle are grain-finished without the use of hormones or antibiotics. To Shaun Daugherty, farming is about taking care of one another. He owns S.E. Daugherty & Sons Farm alongside his wife, Erica, which is just a 20-minute drive from Broadway. While the farm is a family affair — Daugherty’s sons, sister, and grandmother all pitch in — it hasn’t been in existence for generations. Before growing the heirloom tomatoes and cucumbers on your plate, Daugherty was a personal trainer. As a hobby, he began gardening for his clients. His side hustle took off and became a full-time gig five years ago. Even now with more than a dozen restaurants using the farm’s ingredients, S.E. Daugherty remains as a farm-stand operation at its core. Quality comes first to Daugherty, who believes in eating seasonally and grows organic as much as he can. “We’re not capitalizing today and sacrificing tomorrow,” he says. Daugherty has also got a soft spot for the little guys in the business. “We have some of these really small mom-and-pops that might grow a bushel of cucumbers, so there’s no real outlet for them to sell it,” Daugherty says. He’ll pay them a fair price for their produce and market it to restaurants. Those pickles on top of your Nashville Hot Chicken Biscuit? They started off as cucumbers on Daugherty’s farm — as does every other pickle at Ole Red. Head up to The Lookout to enjoy Daugherty’s corn in rotating array of dishes like peeled shrimp salad and lamb ribs with a corn puree. When Joe Habegger wants to sell the watermelon or squash grown on his farm, he handwrites a letter. He then gives that letter to a neighbor. She scans it and sends it to local food distributor Creation Gardens, jotting down what they wish to relay to Habegger before returning the message to farm. It’d be easier to pick up a phone, but Habegger never does. A member of Scottville, Kentucky’s Mennonite community, Habegger avoids the use of technology and believes in the virtues of a simple life. If you visit his farm, located 70 miles north of Nashville, you’d find Habegger and his family harvesting potatoes by hand and using gas lanterns to pick in the field at 3 a.m. There’s no air conditioning. No outlets. “It’s really a blast from the past,” says Ian Navarro, who is part of the Creation Gardens team and often works with Habegger to fulfill restaurant orders. In keeping with traditional methods, Habegger doesn’t use pesticides. “If it’s a bad crop it’s a bad crop, that was just a reality of back in the day,” Navarro says of Habegger’s matter-of-fact approach. Just like his farming practices, many of the fruits and vegetables Habegger grows are old-school, too. A portion of his crop is dedicated to heirloom varieties like Cherokee purple tomatoes and pole beans, which were forgotten in American agriculture for decades. The result: intensely flavorful produce that stands out in a simple dish. The watermelon Habegger has grown for Ole Red is “some of the juiciest, sweetest, most refreshing watermelon ever,” Denomme says. Try it in a chilled salad with cilantro-agave vinaigrette and shaved Fresno chili peppers at The Lookout. Never had yellow watermelon before? Habegger Farms grows traditional red and its sunny, sweet cousin, which tastes like honey. Cheese is what Mary Lyndal Harrison has known her whole life. Her parents, John and Celia Harrison, own Sweetwater Valley Farm in Philadelphia, Tennessee, which they bought in 1987. Now that Mary Lyndal and her brother have gotten years of experience growing up on the farm, they’re getting into the family business. It’s a good thing: Like any good dairy farmer will tell you, cheese made the right way takes time. At Sweetwater Valley, which specializes in cheddar and gouda, that means spending eight hours twice a week transforming fresh milk into blocks of cheese before letting them age for a minimum of three months — and in some cases, over two years. The sharper the cheddar, the older its age. While there’s nothing quite like making the first cut into block of cheese, the Harrison family refuses to cut corners. All of Sweetwater Valley’s products are farmstead cheeses, meaning that the cheese is made on the same farm where the cows are milked. Not only do the Harrisons raise their cows from birth, but they also grow everything the animals eat, mixing their feed by hand. “By knowing exactly what goes into our milk, we can ensure that we’re producing the highest quality of cheese possible,” Mary Lyndal says. Don’t miss the farm’s buttermilk cheddar cheese, found atop Ole Red’s Blue Tick Burger. Milder than other varieties of cheddar, it’s creamy and has “a little twang to it” — how all cheese and country music should be. 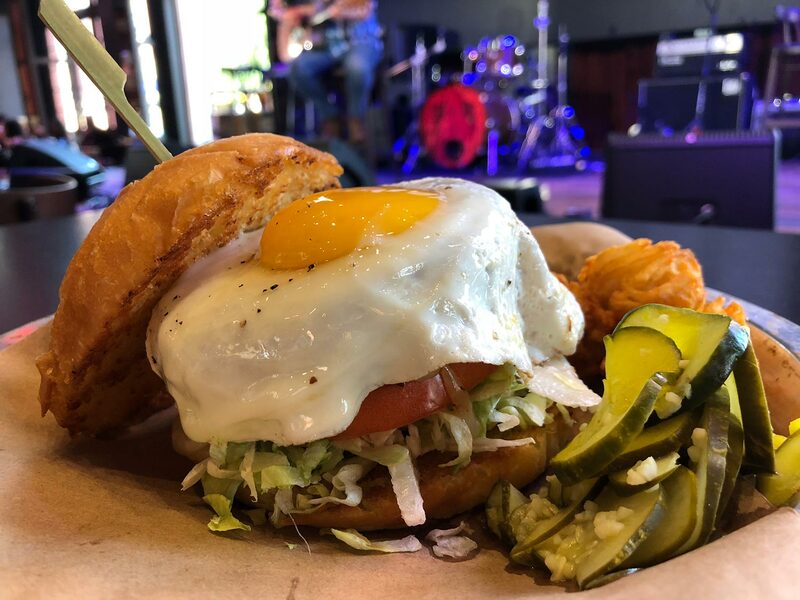 It doesn’t get much more local than Ole Red’s Blue Tick Burger, which is topped with a farm-fresh egg and a slice of Sweetwater Valley Farm cheese. Cheese curds are easier to come by in Minnesota or Wisconsin, but thanks to Kenny’s Farmhouse Cheese, Southerners can get a taste of the fresh, milky Midwestern delicacy from just down the road. Located 80 miles from Nashville in Austin, Kentucky, the farm has been making cheese for two decades. As more restaurants were looking to put cheese curds on their menus, farmer Kenny Mattingly thought to start making cheese curds himself — after all, they are just a natural step along the way to making cheddar, one of the farm’s flagship products. Though the farm didn’t start producing cheese until 1998, it has always been a dairy farm. With a closed herd of cows, Mattingly and his team can ensure that the milk they turn into cheese has the perfect fat content. “With a good cheese curd, you’ll really be able to taste the milk,” says Van Campbell, director of sales at Kenny’s Farmhouse Cheese. “It was milk maybe a day or two before you’re eating it.” Those who want to taste Kenny’s Farmhouse Cheese at its very freshest can book an Airbnb stay in a newly constructed barn on the 300-acre farm — the fridge is stocked with samples. Next time you’re at Ole Red, try the Southern Tater Tot Poutine. 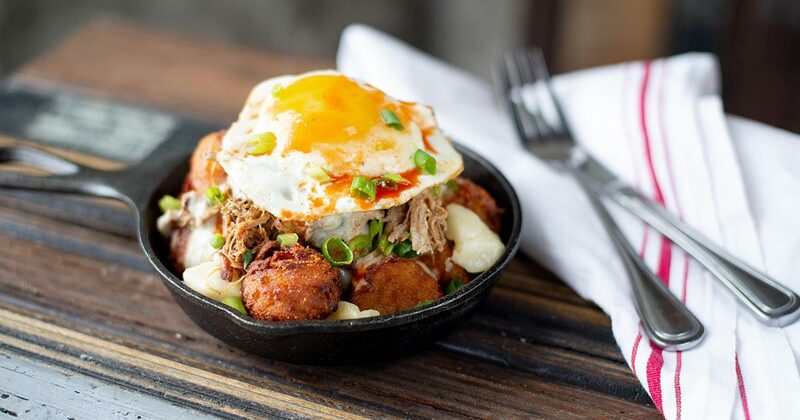 While it’s a riff on Canada’s national dish, it combines some of the South’s most beloved flavors: pulled pork, sawmill gravy, and those irresistible white cheddar curds from Kenny’s.